It’s Week 17 and you’re in your fantasy football championship panicking over who to start this week. If that’s the case, then I only have one piece of advice for you – lobby your commissioner to change your fantasy championship to Week 16! If Drew Brees carried you to the promised land, it’s not fair that you’re now heading into the most important week of your fantasy season wondering if you should be starting Teddy Bridgewater instead. In any case, it’s too late now, so here’s who I’m starting and sitting in Week 17. 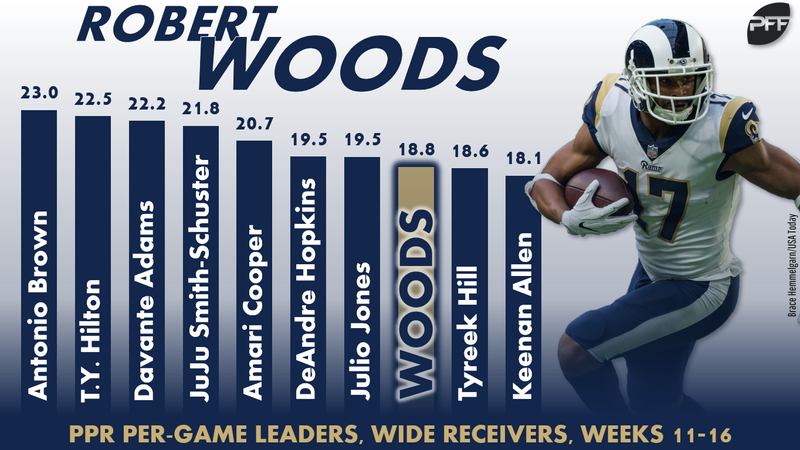 Since Cooper Kupp’s season-ending injury in Week 10, Woods ranks fifth among wide receivers in expected (18.1) and eighth in actual fantasy points per game (18.8). 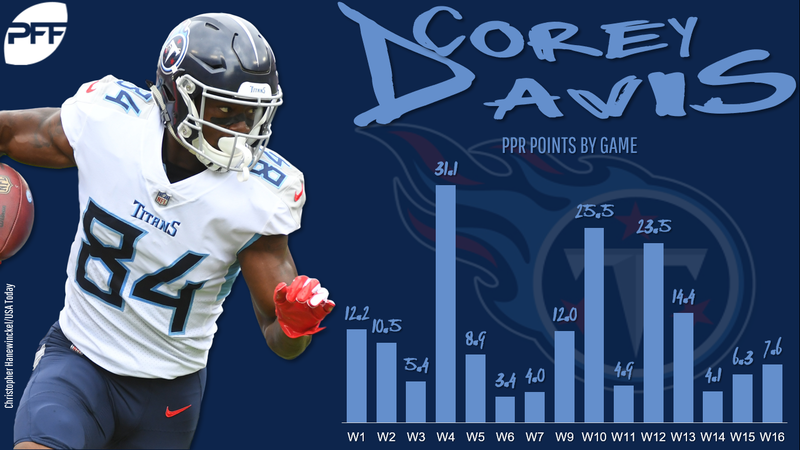 Over this span he’s run 69% of his routes from the slot, which means an ideal matchup this week against a San Francisco defense that is giving up the fifth-most fantasy points per game to opposing slot wide receivers. Behind only the Chiefs, Tampa Bay’s quarterbacks rank second in team fantasy points scored per game (22.1). Winston’s production has been more underwhelming the last two weeks, but those games came against Baltimore and Dallas, who rank best and eighth-best, respectively, in schedule-adjusted fantasy points per game. Now he gets an Atlanta defense that ranks fifth-worst. Since rejoining the Patriots in Week 5, Edelman ranks 12th among all wide receivers in fantasy points per game (16.9). He runs 67% of his routes from the slot, and the Jets rank worst in fantasy points per game allowed to opposing slot wide receivers. Through 11 games, Conner has played on 81%of the snaps while averaging 22.3 fantasy points per game. Across Samuel’s three starts, he’s played on 71% of the snaps while averaging 16.9 fantasy points per game. If Conner is healthy enough to play, you’re starting him. If not, you’re starting Samuels. Whoever it is, Pittsburgh’s RB1 gets a dream matchup against a Bengals defense that is giving up the most fantasy points per game to opposing running backs. If there’s any doubt whether or not Baldwin is actually “back,” keep in mind he’s our highest-graded wide receiver since Week 13. Since returning from injury in Week 6, Mack averages 25.2 fantasy points per game in blowouts (victories by two or more scores). In all other (six of 10) games, Mack averages only 8.7 fantasy points per game. This week, the Colts are only favored by three points, and Tennessee ranks second-best in schedule-adjusted fantasy points per game allowed to opposing running backs. Anderson has been on fire the last three weeks, averaging 23.1 fantasy points per game, but is still a risky bet this week. He’s likely to draw Stephon Gilmore in shadow coverage. Gilmore is our top-graded cornerback and ranks fifth-best of 86 qualifying corners in yards allowed per snap in coverage (0.74). Over the past two years, Anderson averages only 5.7 fantasy points per game against New England. 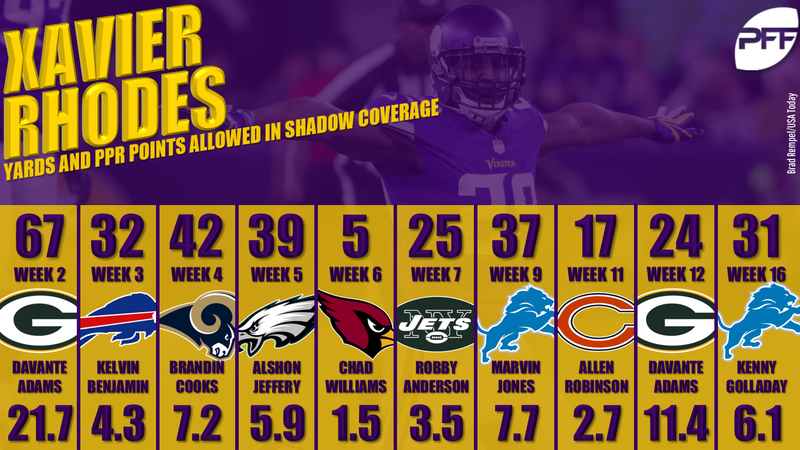 Like Anderson, Robinson is a risky start this week against Xavier Rhodes in shadow coverage. In 10 shadow games this year, Rhodes has given up more than 50 yards into his coverage just once. Rhodes and the Vikings’ secondary also held Robinson to just 6.9 fantasy points in Week 11. As far as rookies go, Mayfield has been awesome, ranking just behind Tom Brady in both passer rating and fantasy points per game. Still, I want no part of this Baltimore defense. The Ravens lead all defenses in schedule-adjusted fantasy points per game and rank second-best in fantasy points allowed per dropback. Cowboys owner Jerry Jones said earlier this week that Dallas will be going “all-out” in Week 17. That makes little sense to me, considering Dallas has nothing to gain with a victory. Still, unless news breaks later in the week implying otherwise, we’re left with no other choice but to start Elliott and hope for the best. Cook has just 43 total yards over his last two games, but I’m expecting a bounceback game this week. Kansas City ranks worst in schedule-adjusted fantasy points per game allowed to opposing tight ends (both over the last five weeks and the full season). When Cook faced them in Week 13, he posted a 7-100-1 line on eight targets. 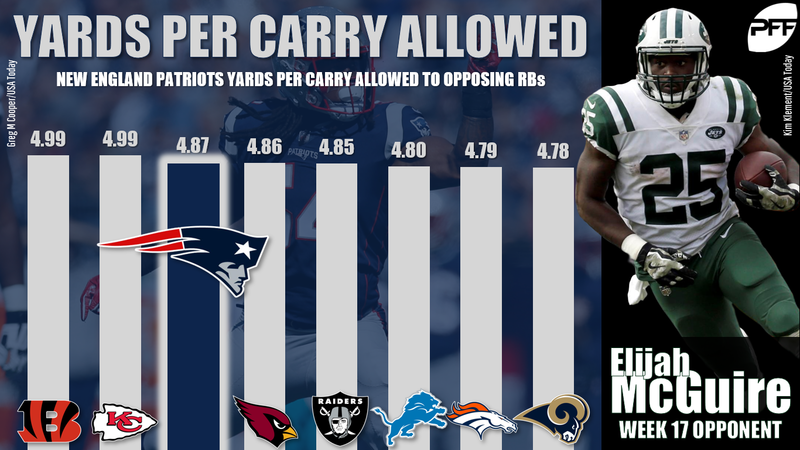 This week he gets a New England defense ranking third-worst in yards allowed per carry (4.88) and 10th-worst in receiving fantasy points per game allowed to enemy running backs. For just the second time in 10 years, Brady ranks outside of the top-10 quarterbacks in fantasy points per game. Even more disappointing than that, he ranks 18th (21.4). Still, I like his upside this week in a game he needs to win to clinch the AFC’s No. 2 seed. The matchup is good as well, as the Jets are giving up the seventh-most fantasy points per game to enemy quarterbacks. Since Week 13, Thomas ranks sixth among tight ends in both targets (24) and fantasy points (44.5). Of course, that’s including a 3.4-point dud against the Saints in Week 15. He gets the Saints again this week, which means the worst possible matchup. In each of the past two seasons, New Orleans ranks best in schedule-adjusted fantasy points per game allowed to opposing tight ends. Sutton scored 18.5 fantasy points in Week 16, but it was also just his second game with at least 11.0 fantasy points all year. It’s hard to trust him this week up against Casey Hayward in shadow coverage. For the second-straight year, Hayward ranks top-10 in fantasy points allowed per route in coverage. Davis averages just 6.0 fantasy points per game over his last three games. The whole right side of Marcus Mariota’s body is “numb and tingly” and he might not even play this week. Indianapolis ranks fifth-best in schedule adjusted fantasy points per game to opposing WR1s. Yeah, he’s an easy fade. Reynolds played on just 51% of the team’s snaps last week as the Rams opted to spend more time in 2TE sets. That makes Reynolds too risky to start this week. Atlanta may prefer to employ a committee backfield, but with Tevin Coleman questionable, they’ll be forced to use Hill as their bell cow if Coleman is out. Hill reached 115 yards rushing on just eight carries last week and now gets a Tampa Bay defense that is giving up the sixth-most fantasy points per game to opposing running backs. If Coleman is active all bets are off, but, as it stands, Hill is certainly worth a look in deeper leagues. Since Week 13, Samuel ranks 20th among wide receivers in expected fantasy points per game (14.6). Despite a shaky quarterback situation, volume should be great this week with Christian McCaffrey likely to sit out. The Chargers aren’t a soft matchup by any stretch, but he should get the softer end of it with Casey Hayward likely to shadow Sutton. Kumerow, who shined in the preseason earlier this before an IR stint during the regular season, deserves consideration as a desperation flex-play in very deep leagues. Kumerow saw three targets last week, catching all of them for 68 yards and a score. Randall Cobb is in the concussion protocol and Equanimeous St. Brown is currently listed as questionable, likely pushing Kumerow into a full-time role. If both are out, I’ll still have Marquez Valdes-Scantling listed higher in my rankings, but not by much.